Please sign our guestbook, leave a comment, or tell us your favorite type of apple. Not an X, sign your name! Congrats you have done a super job with this new site , it’s always a pleasure to see new Stan and Babe websites helping to keep the memory of Laurel & Hardy not only alive but very much to the fore.. Keep up the good work ! Great site and I’m looking forward to the magazine. Mr. Farrell is responsible for the best Sons of the Desert newsletter of the past decade, hands down. A more ‘formal’ magazine is the next logical step. Smooth sailing, Mr. Farrell and Mr. Wiley!! Can’t wait for your first issue! This is a great site, most likely the best one about L&H and all things Roach. I’ll be visiting often and looking forward to the printed magazine next year. Much success with this to Mr. Farrell and Mr. Wiley! Roach films. The 2 articles on “This Is Your Life”, and attachments of TV Guide features and Stan and Ollie’s letters to Ralph Edwards also provided me with a new way of thinking about that program. informative. And Mr. Farrell even remembered my birthday last month – what more do you want? Congrats on the one-month stay on the web. Here’s to hundreds and hundreds of more months. This site is good, very good! Brilliant website chaps- what a tribute to the Boys. Keep it up! I know Lois Laurel Hawes is very proud ! It is about time that a serious, thoughtful website devoted to The Boys now exists where we can review articles about different aspects of The Boy’s lives, films, style and creativity. I especially liked the article on “Hats Off” and I trust that it may still turn up. I learned long ago that comedy is a serious business, and making people laugh is a hard job that goes for 365 days a year. A great website and I look forward to the many articles that I will be reading in the future about The Boys. 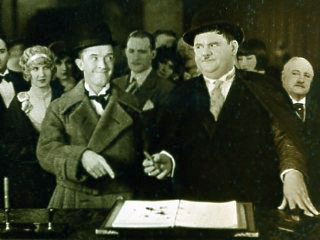 Your website is a refreshingly intellectual approach to all things Laurel and Hardy. It is beautifully designed and well thought out. Congratulations Mr Farrell and Mr Wiley. A happy new year to you all; looks like It’s going to be ! I was referred to your site by a fellow ‘Son’ and was impressed with what I found. This is what its all about – some decent research alongside some rare photographs. I hope your site grows with even more interesting material. I’m looking forward to future articles. The search for “Hats Off” lives on!! Hats off to this website!! Well done guys, you have obviously worked very hard to have come up with such an impressive site. I for one will be a frequent visitor. Nice Website! Fresh colours and design and very good articles and humour. Now we are getting someplace.!!!!! !